This season's Wednesday evening Introduction to Sailing sessions are now over. There was a good turnout for most sessions and we picked up a number of new members for SYC. Fourteen "students" qualified to receive certificates of completion We plan to do it again next season and may even expand it to Sunday afternoons. Plans are in the works for improvements to the SYC area. Click HERE to see a tentative conceptual drawing of the current proposal. See an SYC board member for more info. Come out to Shawnee Yacht Club any Wednesday evening at 6:00 p.m. June through August (EXCEPT July 4th) for the free Introduction to Sailing sessions. We'll get you in a boat, show you how it works and let you try your hand at it. For ages 12+. Click HERE for more info. It was hot and the winds were inconsistent but we had a good crowd for the Memorial Day sailboat rides. Thanks to a last minute press release sent out by Parks and Recreation, we also had good coverage by the local news outlets. Click HERE for video by WIBW. Come out to Shawnee Yacht Club any Wednesday evening at 6:00 p.m. June through August for the free Introduction to Sailing sessions. We'll get you in a boat, show you how it works and let you try your hand at it. For ages 12+. 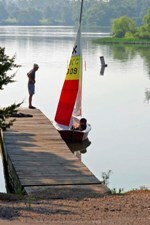 It's time to get ready for another year of sailing activities at Lake Shawnee. Click HERE for the complete schedule of events. The boatyard is now officially open again for boat storage for paid-up members. So, pay your dues, pull the tarp off your boat and haul it out to the lake for the season. Annual dues are only $50 for non-racing members. Click HERE for the membership form. You can pay online through PayPal or you can mail a check. The public is invited for free sailboat rides on May 28th from noon to 4:00 p.m. It's a fun way to try sailing. No previous sailing experience is required. Guaranteed fun for all ages 6 to 60+. These are small boats with weight limitations that tip and, on occasion, capsize. Lifejackets will be provided. Wear casual clothing and non-slip footwear that can get wet. Do not bring electronics, purses, etc. Youth must be accompanied by an adult. Individuals with limited agility or balance, or excessive weight should not participate. You may be required to sign a waiver of liability as there is some risk in this activity. Join Keep America Beautiful -- Topeka/Shawnee County for the Earth Day Cleanup, Saturday, April 21st, 10:00 a.m. to noon. Free lunch, free t-shirts and prizes. More information at kab@kabtopsh.org or call 785-224-0446. Click here for flyer. Topeka's Tulip Time Festival was named a Top 100 Event for Groups for 2016 by the American Bus Association. The festival, this year April 6-23, features more than 120,000 tulips and daffodils in bloom at picturesque locations around Topeka, including Lake Shawnee's Ted Ensley Botanical Gardens, Old Prairie Town at Ward-Meade Historic Site and Gage Park. Click here for more info. Over the winter break, we meet the last Friday of each month at a local restaurant to socialize, talk sailing and enjoy good food and drink. If you're on our email list, you'll receive emails on the time and place each month. Join in the fun. If your boat is still at the lake, be sure to haul it home for the winter. Personal boats cannot be stored at the lake from December through February. But don't forget about sailing during the off-season. Work on any improvements to your boat, read up on new sailing techniques to try next season and join us for our winter social gatherings. If you'd like to get involved with SYC, join our email list by sending an email to . For over 75 years, Topeka and Shawnee County residents have been discovering the fun and excitement of sailing for pleasure, competition and fellowship through the Shawnee Yacht Club. You don't even need a boat to get started. Our Wednesday evening Introduction to Sailing sessions are over for the season but you can still come out for our 2:00 pm races each Sunday through October (weather permitting). We'll get you in a boat, show you how it works and let you try your hand at it. And everyone is welcome to join us for our monthly social events. Click HERE for the complete schedule of events. Here's your opportunity to play golf with some friends and also contribute to the new Shawnee Yacht Club Fund. The SCPR Foundation has established a new fund for the expressed purpose of supporting SYC in its mission of promoting sailing on Lake Shawnee. Click HERE for the tournament registration form. On your check, make sure to indicate you want it to go toward the SYC Fund. Hurry, the registration deadline is October 2nd. For over 75 years, Topeka and Shawnee County residents have been discovering the fun and excitement of sailing for pleasure, competition and fellowship through the Shawnee Yacht Club. You don't even need a boat to get started. Come out any Wednesday evening at 6:00 p.m. for the free Introduction to Sailing sessions. We'll get you in a boat, show you how it works and let you try your hand at it. And everyone is welcome to join us for our monthly social events like the upcoming BBQ dinners and moonlight sails. Click HERE for the complete schedule of events. The reunion event for all current and former members on September 17th, by all accounts, was a BIG hit. We probably had close to 100 -- many of the old-timers. It was a beautiful day. A gentle breeze allowed some of the rusty sailors to get out in the boats. And all enjoyed reminiscing with old friends about their days sailing on Lake Shawnee. Thanks to Mike Rooney, HERE are some great photos of the event. To commemorate SYC's 75th anniversary, the website is featuring SYC historical photos. Those from the 70's and 80's are by Berne Ketchum, Dave Johnson, Thad Allton (and maybe a couple of others). The earlier photos were retrieved from Kansas State Historical Society archives, thanks to Brent Nothern. Current and former SYC members, don't miss SYC's 75th Anniversary Reunion on September 17 from 1:00 p.m. to 10:00 p.m. at SYC. Starting at 1:00, we�ll have boats available for rides or skippering, snacks and refreshments. At 4:00 we'll fire up the grill for burgers and hotdogs with sides. Come revisit those golden days sailing at SYC and reminisce with your old SYC friends. Please RSVP with an email to commodore@shawneeyachtclub.org so we will have an idea about how much food and beverage to buy. With lots of publicity provided by Shawnee County Parks & Recreation, the Topeka Capital-Journal and WIBW TV, along with near perfect weather, about 240 people came out for the free sailboat rides on Memorial Day -- a great way to mark SYC's 75th anniversary. Some stood in line a second time for another ride. We may even get a few new members out of the deal. Thanks to all of the members who helped in the effort. Introductory sailing lessons are scheduled for Saturday, July 23rd, 12:30 - 4:00 p.m. Sign up online here or call 785-251-2600. There is a $25 fee per person. The Class is for ages 16+ and is limited to eight participants. Wear old tennis shoes and clothes that can get wet. Experienced Shawnee Yacht Club members conduct the classes. These are centerboard class boats that do capsize on occasion. Lifejackets are provided but the student should be able to swim. On completion the student should be able to rig a boat, launch a boat and make their way around the lake on all points of sail in light to moderate wind. Mark your calendars for the SYC Annual Business Meeting, scheduled for 1:15 p.m. Sunday, January 10th, at Eric Kjorlie's, 1435 Plass, where we will be reviewing the current state of affairs for SYC, electing officers and making plans for the 2016 sailing season. All current members are eligible to vote but anyone with an interest is welcome to attend. Mark your calendars for the annual SYC Christmas Party/Awards Presentation for Saturday December 12, 2015 from 6:30 p.m. until close at Eric Kjorlie's, 1435 Plass Ave, Topeka (2 blocks north of Washburn University Campus at northwest corner of 15th and Plass)! SYC members, former members and any others interested in sailing at Lake Shawnee are all welcome. This series was held over the four Sundays in October. One was too windy, so we took the opportunity to clean out the shed, but the other three had great sailing weather for October and resulted in a good turnout. Each participating boat received an engraved glass for each Sunday they participated. Beer and hot dogs or burgers were served after each day's sailing. Doug Bennett: An egg McMuffin. Thanks to everyone who participated, to Mark for organizing the event, to Travis for the great custom SYC engraved glasses, to those who provided the beer, and especially to Rochel and Taric Towle for cooking the hot dogs and burgers. This series will be held over the four Sundays in October. 2:00 PM start. Here is how it will work. Each participating boat will get an engraved glass for each Sunday they participate. Four Sundays gets a complete set of four glasses. Each race sailed gets a chance to win the big prize in the final drawing. For example. Sail sixteen races get sixteen tickets in the drawing. Sail two races get two tickets. The more races you sail, the better your chance to win the big prize. Beer and Hotdogs on the grill after each day's sailing. Come out. Have fun. Families welcome Everybody gets something. First prize is dinner for two at the Blind Tiger. Second is dinner for two at Subway. Third prize is an egg McMuffin. For this year's regatta on July 18, the winds were up and down, just right for race 1, then almost too much for race 2. In the afternoon it died to almost nothing for the last race but then picked up a little at the end. It was fun watching the 2 Hobies flying by. Travis Towle may have had first place wrapped up until he capsized in the last race when hit by a puff while trying to get the seaweed off his rudder. Thanks to all those who participated this year and to all the volunteers. Local sailboat racing guru, Mark Marling, of SYC, took first place in this year's annual Orlando Webb Regatta at Lake Lotawana out of a field of 34 boats, including a number of other nationally prominent sailors. See his blog entry below. Make plans now to participate in the 2015 Sunflower State Games Regatta, Saturday, July 18th. The public is invited for free sailboat rides on May 25th from noon to 4:00 p.m. It's a fun way to try sailing. No previous sailing experience is required. Guaranteed fun for all ages 6 to 60+. For safety, youth must be accompanied by an adult. Hello, Shawnee Yacht Club, a place held dear in the hearts of all of the Armstrongs! Todd just completed his first ocean-going yacht delivery from Hong Kong harbor (where he and his family live) to Subic Bay in the Philippines. The 2 1/2 days were quite an adventure! He just sent us this narrative about the experience, and Steve and I were a bit breathless just reading it! 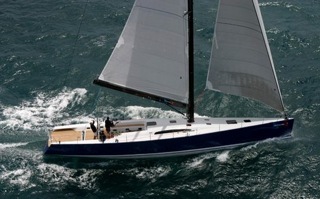 The narrative is by Todd, and the boat is not the one they sailed, but shows what a Marten 49 looks like. Todd inherited some of my Dad's genes, particularly his love of boats. His first drawings as a child were of sailboats, and it shouldn't have puzzled us. At age 10, he sailed a wee boat through the canals of Holland every day, even sailed to school, and went on to become a boat builder after finishing with honors from a boat school in Maine. He headed the wood department at Lake Tahoe's Sierra Boat Company, headed a 2 1/2 year project working with the royal family of Thailand on boat reconstruction, worked with three other young men to develop a significant marina that was designed to wind through a Formula One race track in Abu Dhabi, United Arab Emirates (a marina built for boats up to 400 feet long), had his own boat restoration company in northern California, and is now in Hong Kong working for HUD, a Hong Kong subsidiary of Swire; Projects General Manager. I hope you enjoy the tale! It was harrowing, exhilarating and terrifying, and we are grateful he is safely home with his sweet family! But it does sound like he's "hooked," doesn't it? Sincerely, and with best wishes to the Shawnee Yacht Club for a beautiful holiday season! The sailing season is over, the racing marks have been pulled (along with a bunch of zebra mussels), the pontoon boats are dry-docked and the winter winds came rushing in this week along with the pungent odor of stockyards to our north -- did you get a whiff of that? Don't forget to remove all personal boats from the boatyard before December 1st as required in our contract with the county. And plan to come to the SYC Christmas Party at Eric Kjorlie's home at 7:00 p.m. on December 13th. The Free Sailboat Rides Event 12:00 noon to 4:00pm on Saturday Sept. 6, 2014 was a success with approx. 80 to 100 participating public. Wind was excellent and steady from the Northeast at 8-10 mph, sunny, and a perfect day to be out on the Lake. Special thanks to the Skippers Mark Marling, Tony Towle, and Travis Towle�and the ubiquitous Mike Gorman and Chuck Towle for running the docks. Joyce bought an MC from Marling and will be in-training so look out guys. I took a legit 2nd in one of the races on Sunday but you all know why my ancestors the Vikings always had oars in the boat. Three more race events left on the Sunday schedule before start of the frostbite series. The public is invited for free sailboat rides on September 6th. It's a fun way to try sailing. No previous sailing experience is required. Guaranteed fun for all ages 6 to 60+. For safety, youth must be accompanied by an adult. The weather was perfect -- mild temperatures and moderate, consistent, southerly winds. But we only had 9 boats show up for the 14th Annual Sunflower State Games Regatta on July 19th. The small number of boats allowed us to get in 5 north/south races. It wasn't quite the same without Don and Adeline on race committee. But those who showed up had some great sailing. Photos compliments of Nothern Exposure. The Sunflower State Games Sailing event will take place this year on Saturday, July 19th, at Lake Shawnee. You can register online at www.sunflowergames.com. The deadline for registering online is Friday, July 11th. You can also register on the day of the event for an additional $5 late fee. However, anyone registering on the day of the event will not get a t-shirt, so register early. Lake Lotawana: At the second largest MC Scow regatta of the season, May 31 & June 1, out of 44 boats sailing, SYC's Mark Marling took third place. Congratulation Mark! The first race of the season will be Sunday, June 1, at 2:00 p.m. Hose off that boat and get it out to the lake so you're ready to go. See Mark's latest blog post below for more info on what to expect in terms of race committee, format, etc. Wednesday evening races start the following Wednesday, June 4. Don Towle, long time SYC member/supporter and patriarch of a family of many other current and former SYC members, passed away Wednesday, May 21, 2014. We'll miss him. The public is invited for free sailboat rides on May 26. It's a fun way to try sailing. No previous sailing experience is required. Guaranteed fun for all ages 6 to 60+. For safety, youth must be accompanied by an adult. To help SYC sailors prepare for the racing season, Mark Marling is conducting "Sailing Drills" on May 10 and 17, with objectives to increase boat speed, improve boat handling and learn how to have dynamite starts. Each session will have an on the water drill in each area, followed by a debrief session on land. See Mark's blog posts below for more info. Introductory sailing lessons are scheduled for Saturday, May 17th, 10:00 a.m. to 4:00 p.m. Sign up at the Shawnee County Parks and Recreation office at 3131 SE 29th (east end of the dam), or call them at 785-267-1156. There is a $25 fee per person. The Class is for ages 16 to 60. Class size is limited to eight participants. Wear old tennis shoes and clothes that can get wet. Experienced Shawnee Yacht Club members conduct the classes. These are centerboard class boats that do capsize on occasion. Lifejackets are provided but the student should be able to swim. On completion the student should be able to rig a boat, launch a boat and make their way around the lake on all points of sail in light to moderate wind. Contact with any questions. Despite the excessive heat, the tenth annual Sunflower State Games Regatta on July 21 had a good turnout of 20 boats in 4 fleets. The winds were mostly light. The Johnson County Sailing Society had another good sized contingent and 2 Snipes from Wichita came for the first time. With the heat, we took it easy with only one race in the morning and one in the afternoon. The new automated 3 minute start sequence was a big hit. Besides the sailing, we all enjoyed the lunch, the watermelon and visiting with other sailors. Thanks to all who participated and especially to the volunteers who made it happen. Despite the excessive heat, the ninth annual Sunflower State Games Regatta on July 16 had a good turnout of 27 boats in 4 fleets. The winds were moderate. The Johnson County Sailing Society had another good sized contingent. With the heat, we took it easy with only three races. Besides the sailing, we all enjoyed the lunch, the watermelon and visiting with other sailors. Thanks to all who participated and especially to the volunteers who made it happen. On June 21, 22 and 23, for the fourth year, Shawnee Yacht Club hosted a sail academy for two dozen cadets from the Navy Junior Reserve Officer Training Corps. Organized by Jeff Richards, the senior naval science instructor at Shawnee Heights High School, the cadets spent their evenings at the YMCA's Camp Hammond and their days at SYC learning and practicing sailing. Besides Richards and several other NJROTC adult leaders, a group of SYC members helped with instruction and coaching. The cadets came from Shawnee Heights High School, Shawnee Mission North High School, Excelsior Springs, Mo., and Claremore, Okla. Winds were brisk so the students got plenty of practice recovering from capsizing. SYC members click here for the complete meeting minutes. In case you haven't noticed, the SYC storage shed has a new roof and a new paint job. Last fall L.D. Nicolay and his roofing crew tore off the old tattered shake shingles and installed new asphalt shingles. And this spring, H.B. Marshall, with assistance from Ken Waters, applied several coats of new paint. H.B. reportedly claims that his paint job comes with a lifetime guarantee. The seventh annual Sunflower State Games Regatta on July 17 was bigger than ever with 32 boats competing. This was also the first year we had enough young people to have a youth class sailing MC Scows. The Johnson County Sailing Society had a good sized contingent and there were a couple of boats from Clinton Lake as well, and one from Salina. It was quite hot and the winds were a little light so we took it easy with only three races. Tony Towle served as the SSG Sailing Commissioner this year and had things well organized. Besides the sailing, we all enjoyed the lunch, the watermelon and visiting with other sailors. Thanks to all who participated and especially to the volunteers who made it happen. On June 22, 23 and 24, for the third year, Shawnee Yacht Club hosted a sail academy for about 30 male and female youth members of the Navy Junior Reserve Officer Training Corps. Organized by Jeff Richards, the senior naval science instructor at Shawnee Heights High School, the cadets spent their evenings at the YMCA's Camp Hammond and their days at SYC learning and practicing sailing. Besides Richards and several other NJROTC adult leaders, a group of SYC members helped with instruction and coaching. Former SYC member, Duane Raine, came all the way from Texas to help out. The cadets came from Topeka, Springfield Missouri and Oklahoma. Ten boats from Johnson County Sailing Society helped give us a respectable number of entries this year for the Sunflower Games Open Class Sailing Regatta on July 18th. A rare July cool spell provided beautiful pleasant weather, although the winds were a little light at times. Thanks to all who participated and especially to the volunteers who made it happen. See awards ceremony pictures above -- more pictures to come soon. On June 16, 17 and 18, for the second year, Shawnee Yacht Club hosted a sail academy for about 25 male and female youth members of the Navy Junior Reserve Officer Training Corps. Organized by Jeff Richards, the senior naval science instructor at Shawnee Heights High School, the cadets spent their evenings at the YMCA's Camp Hammond and their days at SYC learning and practicing sailing using the SYC Youth Group MC Scows. Besides Richards and several other NJROTC adult leaders, eight SYC members helped with instruction and coaching. The cadets came from Topeka, Springfield Missouri and Oklahoma. Richards hopes to continue the Sail Academy as an annual event that will grow in participation. Introductory sailing lessons have been scheduled for June 6th and 13th, 10:00 a.m. to 2:00 p.m. Sign up at the Shawnee County Parks and Recreation office at 3131 SE 29th (east end of the dam), or call them at 785-267-1156. There is a $25 fee per person. Experienced Shawnee Yacht Club members conduct the classes. Two hours each day is spent discussing the various topics in a learn-to-sail book and the other two hours is spent on the water in a sailboat where a skipper demonstrates and the student tries their hand at it. If the student has a sailboat, we can use it, otherwise we use ours. These are centerboard class boats that do capsize on occasion. Lifejackets are provided but the student should be able to swim. On completion the student should be able to rig a boat, launch a boat and make their way around the lake on all points of sail in light to moderate wind. Contact Commodore with any questions. It was a beautiful day for sailing at this year's SSG Regatta, on July 19th, with medium wind and pleasant temperatures. The turnout was lower than last year's record but there was a nice grouping of five boats in each of three classes with two ties in the Open class. CJOnline and WIBW TV came out and took photos and video (see links below). Thanks to all those who participated and especially those volunteers who helped make it happen. We're always looking for ways to improve this event and get more participation so please if you have any suggestions. June 16, 17 and 18, Shawnee Yacht Club hosted a sail academy for about 25 male and female youth members of the Navy Junior Reserve Officer Training Corps. Organized by Jeff Richards, the senior naval science instructor at Shawnee Heights High School, the cadets spent their evenings at the YMCA's Camp Hammond and their days at SYC learning and practicing sailing using the SYC Youth Group MC Scows. Besides Richards and 2 other NJROTC adult leaders, eight SYC members and several from the SYC Youth Group helped with instruction and coaching. The cadets came from Topeka, Kansas City and Springfield Missouri. Richards hopes to continue the Sail Academy as an annual event that will grow in participation, and SYC members have already offered to help again next year. This year's SSG Regatta, on July 14th, had a big increase in participation, twice the number from last year. This was due to both an increase in local SYC entries and also a large group of entries from the Johnson County Sailing Society based at Shawnee Mission Lake. Thanks to all those who participated and especially those volunteers who helped make it happen. It was a wonderful day of racing. Temperatures were in the 80'S with wind out of the north at 5-15 mph. Mike Rooney and crew Scott Schafferman of SYC won in the C Scows, Jacob Bures and crew Chuck Towle from SYC won in the MCs, and Rob Swenson and son Rory from Overland Park won the Open class in their Sunfish. Besides Rob and Rory, we were also joined by 3 C Scow teams from Lake Jacomo, some Scouts from Manhattan in an FJ and Dave Orr from Lake Sherwood in his Dolphin Sr. Courtesy of the Shawnee County Parks & Recreation Department, up-to-the minute weather conditions at the lake are now posted in the sidebar to the right. This weather data comes from the new weather station located just outside the administration building at the east end of the dam. Click the "More Details" link at the bottom of that section to go to the Parks & Recreation Lake Weather web page for additional weather data. PS: The Forbes Weather data in the right sidebar comes from the National Weather Service and is updated hourly. Click here to pay your dues with a check or on-line with a credit card through PayPal�. It'S quick and secure. A PayPal� account is NOT required. Introductory sailing lessons have been scheduled for May 6th and 13th, 8:00 a.m. to noon. Sign up at the Shawnee County Parks and Recreation office at 3131 SE 29th (east end of the dam), or call them at 785-267-1156. There is a $50 fee per person, which includes a Shawnee Yacht Club associate membership. We could have used a little more wind but it wasn't really as bad as this picture suggests. There were 19 boats, up from 14 last year, and several new entries from the Kansas City area, allowing us to run 3 classes: C Scows, MC Scows and Open. Being Missouri residents, Ken Kuse and Scott Tillema, the C Scow and MC Scow winners, were not eligible for the Sunflower Games medals but Commodore Chuck Towle had very nice hand made plaques for all boats. Dave Orr, from Sherwood, took the Open class for the third year. Besides running RC, Don Towle also brought his pontoon boat for rescue use, so H.B and Ken rode in style. And they only had one rescue to interrupt their naps. Tom Gregg, a longtime SYC member and avid supporter died February 15th. We'll miss him. 2005 Officers: Commodore - Chuck Towle, Vice Commodore - Doug Bennett, Secretary/Treasurer - Dave Krug, Property Chairman - Mike Gorman, Social Chairman - Jim Schwartz, Publicity Chairman - Pat Towle, Governor - Mike Rooney. Lake Shawnee Boat Licenses: It appears the County will no longer require lake stickers. Sunflower State Games / C Regatta: The current plan is to hold a C Scow regatta in conjunction with the Sunflower State Games regatta on July 16th. Heavy rains raise lake level. Dave Krug, right, checks the time as he competes with Mike Rooney, center, and Nicole Nichols in the C Scow race during the Sunflower State Games sailing regatta at SYC on July 17. We finally had an opportunity to honor Jim Schwartz with a framed Past Commodore flag for his service as Treasurer, Vice Commodore and lastly Commodore in 2002. 2004 Officers: Doug Bennett offered to continue as secretary/treasurer, John Maddux as Vice Commodore once more and Tom Baumann, after seeing the impressive framed Past Commodore Flag that Jim received, agreed to take on the Commodore position. Sunflower State Games Sailing Regatta -- We will do this again this year, on July 17. Mike Gorman offered to head this up again. Sailing Lessons -- Jim Schwartz offered to run the classroom portion of the lessons this year. Jim worked with Brian Toby at the County and scheduled these for the first four Wednesday evenings in June. Property Chairman: H.B Marshall offered his services for this office. There is about $1,800.00 in checking account, mostly as a result of eliminating our property insurance. Our old stuff just isn't worth the annual expense. And membership is slowly increasing again. Dues will remain the same -- $85 for boat owners and $45 for associates. Our Spring sailing lessons resulted in the following new members: Jim Duniven, Rod & Jan Furgason (Dagger), Scott Gesner & Marlene Graber (Sweet 16), Don Krutsinger (Buccaneer). Wecome to the club! Another successful C Regatta -- see June 2003 news below and click here for CJOnline article. The First Annual Sunflower State Games Sailing Event went well and we're looking forward to the 2004 event. Our Christmas Party at Ken & Sharen Waters residence also served as a going away party for long-time members Bern & Kathy Ketchum, who have retired to Iowa. The 46th Annual SYC C Scow Regatta was held Saturday, June 21. Although there were only 10 boats this year, the mild weather and ample wind from the south made for good sailing on Lake Shawnee. Dave Cooley, of Lake Lotawana, and always a contender, took first place. That evening, the mild weather and the breeze continued for an enjoyable club cookout at the lake with hamburgers provided by HB & Leah Marshall. Click here for regatta results. Don't forget, SYC is sponsoring the sailing event for the Sunflower State Games on July 19. We'll need help from lots of SYC members to pull this off, but it should be good for our club. Click here for the latest details on the schedule, format, etc. And you can now register to sail in the event at http://sunflowergames.com. The County reports they received a Coast Guard grant for two new 80 foot plastic docks for the Yacht Club area. But the funds have not yet arrived, so it will be late this season or early next season before they are installed. To get us through the C Scow regatta, they brought back one of our old wood docks and we'll also have to make do with the old docks for the Sunflower State Games this year. But, you can look forward to some nice docks next year. It's that time again. If you haven't already, please send your 2003 dues to SYC, PO Box 221, Topeka, 66601 -- $85 for Full Members (boat owners) and $40 for Associate. In 2002 our expenses were quite a bit more than our income. This year we'll be looking for more ways to reduce expenses but we will also need all the income we can get. Even if you're not an active member, please consider sending in a Full or Associate membership. Click here for the 2002 Treasurer's report. In case you've been looking for your invitation in the mail, to save on expenses we will not be holding an Awards Banquet this year (see Dues above). The annual Wine & Cheese party will be held as usual to kick off the season. Plans are progressing for SYC to sponsor a sailing event for the Sunflower State Games this Summer. The 2003 games are scheduled for July 18, 19, 20, 25, 26 and 27, with sailing currently planned for Saturday, July 19th. This event will be held in lieu of our traditional Bell Cup regatta. Click here for the latest details on the schedule, format, etc. You can find out more about the State Games at http://sunflowergames.com and http://www.stategames.org. Once again we will be teaching sailing classes through Shawnee County Parks and Recreation. Two weekend classes and two evening classes are planned. The dates are still being worked out. Is your boat still at the lake? According to our contract with the County, "Any boats remaining on the property between November 25 and March 31 will be considered abandoned and will be disposed of as provided by law...". The club's two pontoon boats are the only exception. So you'd better get it hauled off before the County does it for you. The club is considering hosting a sailing event for the Sunflower State Games next Summer. It would essentially amount to running a regatta. You can find out more about the State Games at http://www.sunflowergames.com and http://www.stategames.org. The 2003 games in Kansas are scheduled for July 18, 19, 20, 25, 26 and 27. All of the the details would be up to SYC to determine, e.g. the date, the classes of boats, the format, the schedule, etc. If you have any thoughts on this or would like to volunteer to help, please contact Mike Gorman . Commodore Jim Schwartz, "old" members Jerry Kroeker and Mike Gorman, and "new" members Doug Bennet and Dave Krug took care of the Fall chores on Saturday, October 26th. The racing marks were picked up, the two pontoon boats were hauled out of the water and the motors were put away in the shed. Then we all headed to the Shack for lunch. Raising the blue flag signifies boats are finishing. A horn will be sounded each time a flag is raised or lowered. The sequence is repeated for a second class start. The warning signal for each succeeding class shall be made with or after the starting signal of the preceding class. On Wednesday, August 14th, we had our first race committee training session. Five students had their first lesson on the duties performed by the race committee including the flag order for the starting sequence. They did very well. We are hoping to get enough people trained so the club will be able to operate the RC boat for future races. We were very fortunate to have Connie Henderson and John Maddux, of Lake Jacomo, serving as Race Committee for our Wednesday evening races this summer. They also provided race committee training for several newer sailors. This year's Bell Cup was held Saturday July 20 and Mike Rooney took the honors again. It was a little warm, but the wind was perfect. Starting about 10:00 a.m., we ran 3 races and were putting the boats away by noon, missing the mid-day heat. Most of us stopped at the Shack for a round of drinks and lunch before heading home. Dinner that evening at the club was also a little warm, but enjoyable due to a nice breeze, and the burgers, hot dogs and various side dishes/desserts were delicious. All who participated seemed to enjoy the day. Thanks go to Bern Ketchum, Rich Hayse and Bud Brunton for doing their usual professional job running race committee. The 45th Annual SYC C Scow Regatta was held Saturday, June 22. We only had 12 boats register this year but there was plenty of wind, as indicated by all of the DNS/F's in the scores. Mark Long, from Lake Winnebago, took first place. Dinner that evening was held at the Blind Tiger. Click here for regatta results. SYC is again running sailing classes in conjunction with the Shawnee County Parks and Rec. - 8:00 - Noon on June 8 and 15. We spend the first half of each morning on shore with instruction and discussion and the rest of the time on the water. SYC members, please come on out and help. It counts as a race qualifier. It's also an opportunity to pick up new SYC members. The racing is already off to a much better start than last year, possibly in-part due to the change from Sunday afternoons to Saturday mornings. Races were held as scheduled the first two Saturdays in June, although the first Wednesday evening was cancelled due to lack of wind. We need your input. In an attempt to increase participation in racing, we are considering moving the traditional Sunday afternoon races to Saturday mornings, either just for June and July, or for the entire season. Let us know what you think . Avast, mateys! This is your new Commodore speaking! I'd like to pump a little life into the venerable club this winter and spring by initiating a monthly social gathering called "First Fridays." On the first Friday of each month, starting February 1, you can join other SYC members at the Blind Tiger for some cheer and camaraderie. Officers will meet at 4 p.m. to conduct a little business, and others are welcome to participate in that. The general gathering will start at 4:30 and run till 6:00. We'll try to feature a special theme, speaker or entertainment at each meeting. For instance, I'd like to see a video documentary of the Whitbread race. Maybe Mark Marling could give a racing lesson. At our first meeting next week, we'll do some brainstorming and talk about upcoming events that the club will sponsor. You're welcome to order dinner while we're there. We'll be meeting in the loft area at the Blind Tiger (on 37th and KS Ave.). They call that loft "the nest," so ask for it when you arrive if you're not sure where it is. It's the same spot we met after the Bell Cup last summer to see a slide show. If you can't make the first meeting but have some related (or unrelated) suggestions, please reply. The annual SYC Christmas Party was held at Mike Rooney's place on December 8. We had a good crowd, watched a KU game and looked over Mike's photo and slide collection. You should have been there!! Of course, we also held the obligatory annual business meeting where there was no opposition to Jim Schwartz moving up to Commodore for 2002, Tom Baumann to Vice-Commodore and Mike Gorman starting a second tour as Secretary-Treasurer. Tom Baumann, Mike Gorman, Rich Hayse, Eric Kjorlie and HB Marshall met on a crisp Saturday morning last October to work on a project to mark storm drains in the Lake Shore Estates area -- west of the lake between 29th and 37th as part of an effort to promote conservation around the lake. Mike has been serving as the SYC representative on a committee studying ways to promote conservation practices in the Lake Shawnee drainage district. There have been mailings to area residents promoting conservation practices and signs posted around the lake to remind the public to "Keep Beautiful Lake Shawnee Beautiful". Various groups also marked the storm drains in the drainage district with signs reminding residents to dispose of hazardous materials properly -- not down the storm drains that eventually drain into Lake Shawnee. Doug and Marlys Bennett bought Duane Raine's old C Scow, Banana, after attending our sailing class last September. We hope to see them on the water this coming Summer. SYC conducted a sailing class for 7 adults this past fall, sponsored by the Shawnee County Parks and Rec department. The weather forced the first Saturday morning session indoors, but most of the participants came out the following Sunday for rides and some time at the tiller. One more session the next Saturday got them out on the water again. Hopefully, we've recruited a few sailors and maybe some SYC members out of the bunch. Commodore Duane Raine led the classes, assisted by Mike Rooney. Tom Baumann, Jim Schwartz, Bill Allman and Mike Gorman also helped out. Welcome to new members William (Bill) & Phyllis Scott, sailing a C Scow they purchased from their neighbor and former SYC member Steve Burghart. Also, their son Eric and his wife just recently purchased the Clipper on the classifieds page. The temperature was very HOT, but the wind was good for the annual Bell Cup club championship on July 21. Of course, Mike Rooney took first for the second year. There was time for one more race in the afternoon and that allowed Mike Gorman, with tactics being called by crew Bill Allman, to tie Jim Schwartz for second place. Thanks to Bern Ketchum and Rich Hayse for running race committee. Dinner that evening was at Blind Tiger restaurant and featured some fantastic slides of Jim and Lisa Schwartz’s bare-boat trip to exotic spots in the Caribbean, along with some of Mike Rooney’s candid SYC shots. The week of July 9-13, SYC members conducted sailing classes for 11 Shawnee County Parks and Rec. day camp kids, plus one counselor. Commodore Duane Raine put them through 3 mornings of book work on shore under the shade, and then Mike Gorman, HB Marshall, John Maddux, Duane Raine and Mike Rooney all helped with 2 days of on-the-water sailing instruction on C Scows and Maddux's Sunfish. All seemed to have a good time, the kids learned something about sailing and the club earned a little money. The SYC parking lot was full of activity the evening before this year's C Regatta, with the Jacomo club there in full force, rigging their boats. A number from Lotawana and Shawnee showed up in the morning, resulting in a total of 18 boats. This year's regatta on June 23rd was a one day event, which seemed to be a popular change, and the weather was ideal. Thanks go to the race/rescue crew of: HB Marshall, Pat Salsbury, Ed Schraeder, Bud Brunton and Jim Bell. Thanks also to Duane Raine, Jim Schwartz and Tom Baumann for coordinating the event and to Delores Raine for the delicious meal that evening. The SYC rowboat is missing again and presumed stolen. So, please be on the lookout for used rowboats for sale. Contact commodore Duane Raine if you get any leads. In place of the walkways to the south boat racks the County has installed a T dock. Now they would like the rack owners to arrange the racks around the T dock and paint the racks to improve the looks of the area. Contact Commodore Duane Raine for more details. This is the "new and improved" SYC web site. This area of the home page will contain the latest club news and will hopefully be updated regularly, even during the off season. Previous news articles will be available through the news archive link below. Other content is available through the links to the left. Content under the "Members Only" heading requires a password because it is intended only for club members. Visitors are welcome to look over everything else. The annual SYC C Scow Regatta was held the weekend of June 24 and 25 and, even though a number of local skippers were unavailable, the event drew quite a number from the Lotawana and Jacomo clubs in KC and one from Windycrest YC in Tulsa. These other clubs have been good to us every year. The weather was good both days - maybe a little hot - with moderate winds that were erratic on Saturday but more consistent for Sunday morning's final two races. Greg Clagett barely arrived in time to make it to the first race starting line before the gun and then proceeded to win the race. At the lunch break he took care of the regatta registration formality and then went on to take first in the regatta. Greg would like to thank Mike Rooney for beating Eddie Robison in the first race, which resulted in Eddie taking second place in the regatta, just 1/4 point behind Greg. Bob (Wide Load) Cooley finished the Lotawana sweep by taking third. Thanks to all of the out-of-towners for supporting our regatta for another year. Thanks also to all of those who helped pull it off again, particularly Jerry and Betsy Kroeker for the wonderful food, and Rich Hayse and Bud Brunton for race committee. Everyone really seemed to enjoy this one.